← Should I try Canning Zucchini? 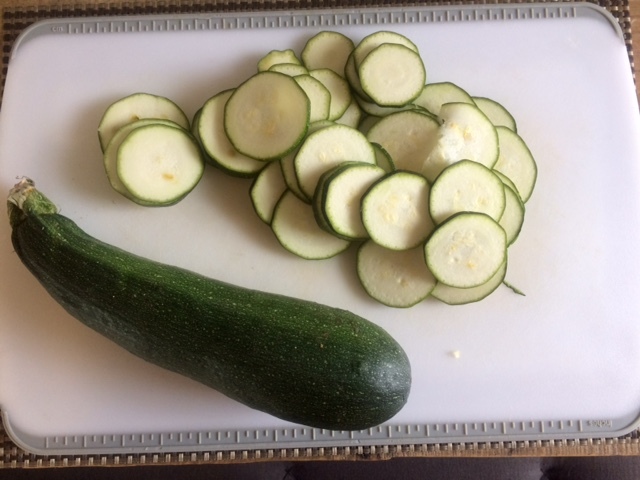 After the awesome responses on my post about what to do with my extra zucchini last week, I was excited to get to work and try some of your ideas. 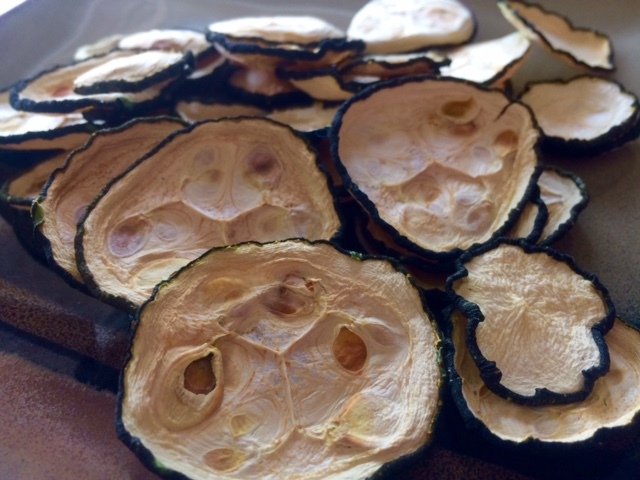 I decided that my first attempt at zucchini preservation would involve dehydrating. I don’t actually have a dehydrator, but the stove at my dad’s house (where I was working on this project) does go all the way down to 150 degrees, so I felt confident that I could make it work. I followed this recipe pretty much exactly. First, I preheated the oven to 150 and got out a large cookie sheet and lined it with parchment paper. 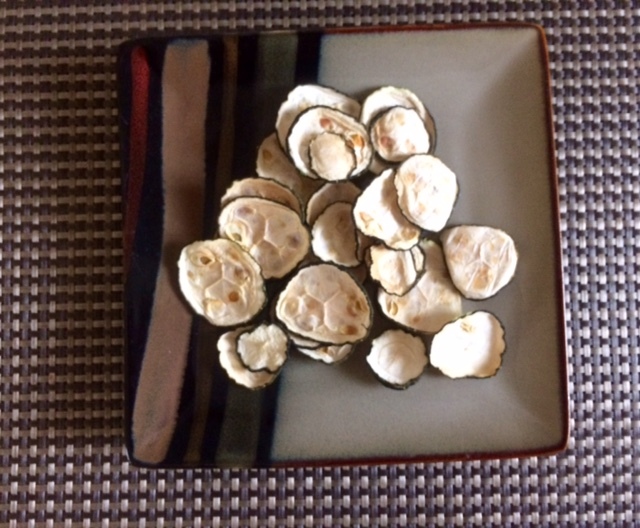 Next, I sliced the washed zucchini into 1/4 inch pieces. I arranged the pieces on the cookie sheet so that they weren’t touching and placed them in the oven. The website said that the zucchini would be ready in 4-6 hours and to leave the oven door cracked. I did not crack the oven door because I have some very naughty, nosy dogs. Even with the oven door shut though it still seemed to work great. I left the zucchini in for a full 6 hours because when I checked them earlier than that they were not fully dehydrated yet and still retained some of their mushiness. At the 6-hour mark a few of them were still mushy, which seemed odd, but I just took out the finished ones and left the mushy ones in for another hour. All of the zucchini were ready at the 7-hour mark. 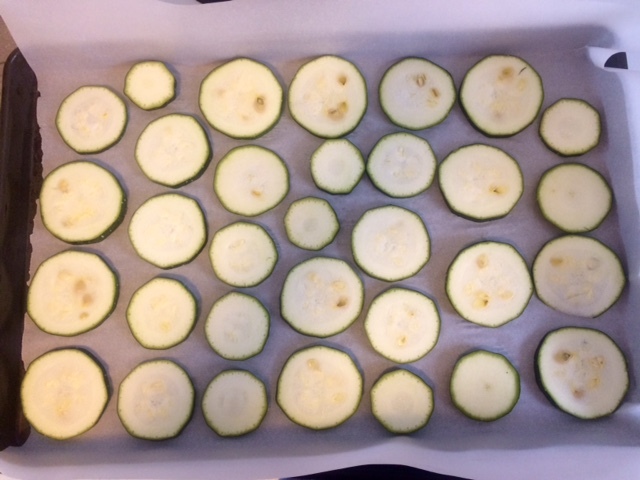 Overall, dehydrating the zucchini worked great! I wouldn’t mind trying to season a batch or spice them up a bit somehow in the future, but I was happy with how easy the whole process was. For this batch I only used one zucchini because, in the spirit of zero food waste, I didn’t want to end up with a bunch of ruined zucchini. I figured if I tried it with only one and that one turned out crummy, I could throw it away pretty guilt-free. My plan for this dehydrated zucchini is to seal it up in vacuum-sealed bags and mail those bags to my house in Alaska. Then, this winter I can pull them out and add them to soups and such. I’m very excited to see how they turn out when I actually start cooking with them! This entry was posted in Food Waste, Simple Year Six, Sustainable Food. Bookmark the permalink. The zukes would probably have dehydrated faster if you left the oven door open, because the moisture would have escaped out the oven door. Hi Roberta! I figured the door was the culprit for the lengthy dehydrating time, but wasn’t 100% sure. Thanks for confirming that for me. My grandmother used to do this — she’d even soak them in water if she needed them for, like, bread or something, to get them slightly back to “normal.” Bonus that these packets will be lighter to mail than jars! I never got back to you on zucchini relish. I don’t actually make that — we prefer pickles — but there are lots of recipes. I’d recommend checking out a canning book by Ball. Oh, excellent — yeah, do! I love to put zucchini in spaghetti sauce.